For the first time I had the opportunity to visit the Canadian International Auto Show during “Press Day”. Overall the show was okay, not as exciting as shows south of the border, but it’s Canada’s largest auto show. After browsing through the entire show, my last stop was the “AutoExotica” exhibit, featuring cars from world-class brands such as Lamborghini, Mclaren, (to my surprise) a Pagani Huayra, along with many more. Pictures of the Pagani Huayra and Mclarens are attached below. 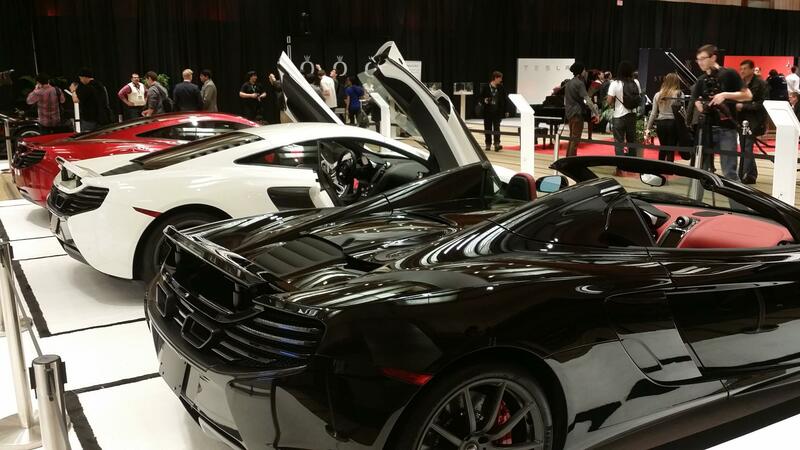 Pfaff Automotive brought out 3 Mclarens, a 2015 Mclaren 650S Coupe, 2015 650S Spider & 2012 12C that features a McLaren Special Operations front bumper. While it was a dealer and not Mclaren that brought these out, the entire display was minimal but effective, Mclarens on ground level surrounded by a barrier with a small lounge behind them. Fortunately, placement of the barrier allowed anyone to get up close and walk around all 3 models. Even with being that close, some people were wondering if the Volcano Red 12c was a 2015 650s, which has me thinking if Mclaren kept design of both models a bit too close to each other, being a Mclaren enthusiast it was easy to spot the differences, I’m sure many of you here can as well. A joint project between Mclaren Toronto and Pfaff Tuning, the 12c-Spa F is the pinnacle marryment of performance and style. Featuring the Mclaren Special Operations front carbon bumper, Vorsteiner carbon side skirts and full carbon rear bumper/diffuser. the Spa F also features custom lowering springs offered by Pfaff Tuning, a first in the world. Custom built ADV.1 ADV6 Track Spec wheels were fitted and custom engraved specifically for the car then wrapped in Pirelli P Zero Trofeo Tires. An Evolution Motorsports Stage Two Power Package was installed, bringing the 12c to over 700HP. The exhaust system is entirely custom built by Pfaff tuning and featuring ultra high flow cats, stainless steel construction and ceramic coated tips. Custom striping and livery added. Lastly, a full carbon $2 Million price tag Pagani Huayra, another vehicle to thank Pfaff Automotive for. Last edited by 650SAdmin; 03-02-2015 at 12:06 PM. Great forum. These cars are simply owsum. Everyone like this event but it is my strong belief that this is the start of something new and even better. I've joined cheap essay editing service this month and I will share this with my friends.